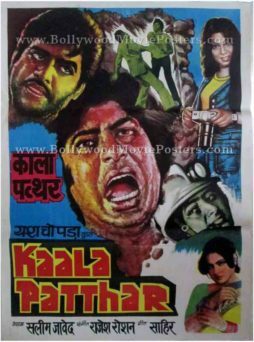 Old school Bollywood poster for sale of the Hindi film, Kaala Patthar (1979). This is an actual surviving old Bollywood poster for sale of the 1979 film that featured the greatest superstar of Indian cinema, Amitabh Bachchan in the lead role. Kaala Patthar is considered a Yash Chopra classic, making this old Amitabh movie poster, very collectible. Printed and circulated several years after the first release of the film (late 1980s), this Amitabh Bachchan old movies poster was originally designed for publicity of the film but never ended up being used. This old Amitabh movie poster was originally designed in hand drawn format on canvas. The original angry young man of Bollywood, Amitabh Bachchan is seen prominently in the center in a screaming avatar. 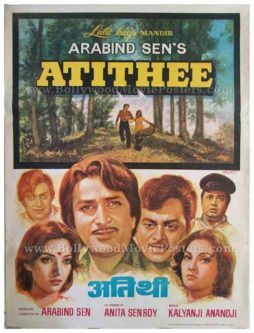 Sharughan Sinha and Shashi Kapoor are seen in quirky hand drawn avatars in this old Amitabh movie poster. Actresses Parveen Babi and Raakhee Gulzar are seen at the top and bottom respectively of this old Amitabh movie poster. 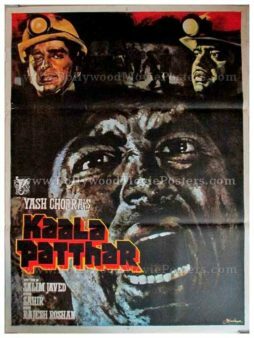 Kaala Patthar (Black Stone) is a 1979 Hindi action film produced and directed by Yash Chopra. The story was written by Salim-Javed and it highlights the plight of workers in coal mines run by ruthlessly selfish owners. 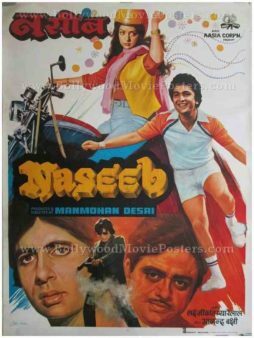 This film was the fourth collaboration between Amitabh Bachchan, Shashi Kapoor and director Yash Chopra after the hugely successful Deewaar (1975), Kabhie Kabhie (1976) and Trishul (1978). Old Bollywood poster for sale of the classic Hindi film Hoshiyar (1985). This is an actual surviving vintage Bollywood poster of the 1985 Hindi film that starred Jeetendra, Shatrughan Sinha, Jayaprada and Meenakshi Sheshadri in lead roles. Printed and circulated during the original first release of the film (somewhere in the mid 1980s), this vintage Bollywood poster for sale was designed for publicity of the film but never ended up being used. This old Bollywood movie poster for sale was originally designed on a canvas board using a collage of still photographs pasted against a hand painted background. A stunning photographic still of the two leading ladies Jayaprada and Meenakshi Sheshadri in a dancing pose from the film is seen prominently in this old Bollywood poster. The actresses seem to be dressed in tribal outfits. Typical of most Bollywood songs, backup dancers are seen in the background of this vintage Bollywood poster. A shade of green is used in the hand painted background of this old Bollywood poster. The entire poster is encased in a solid black border giving it a very catchy appearance. Old Bollywood poster for sale of the classic Hindi film Be-Reham (1980). This is an actual surviving vintage Bollywood poster for sale of the 1980 Hindi film that starred Sanjeev Kumar, Shatrughan Sinha, Mala Sinha and Reena Roy in prominent roles. Printed and circulated during the initial release run of the film (somewhere in the early 1980s), this old Bollywood poster for sale was designed for publicity of the film but never ended up being used. This vintage Bollywood poster was originally hand designed in oil on canvas format by an art studio in Bombay. Quirky hand drawn portraits of the lead actors are seen painted in a Simpsons-like avatar in bright yellow in this old Bollywood poster. Actor Sanjeev Kumar is seen in a quirky portrait prominently in the center, while Shatrughan Sinha and Reena Roy appear on either side. Typography in this vintage Bollywood poster appears in bright red. A combination of bright yellow and red color is used in the design of this old Bollywood poster, giving it a very catchy appearance. 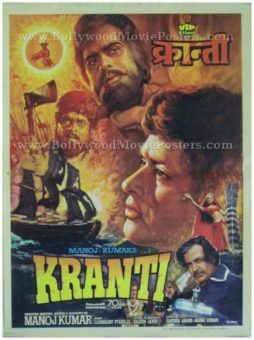 Old Bollywood poster for sale of the patriotic Hindi film, Kranti (1981). This is an actual surviving vintage Bollywood poster of the 1981 Hindi film that featured a stellar star cast comprising Dilip Kumar, Manoj Kumar, Shashi Kapoor, Hema Malini, Shatrughan Sinha and Parveen Babi, among others. Written by Javed Akhtar, Kranti marked the return of the ultimate method actor of Bollywood, Dilip Kumar after a five year hiatus. Printed and circulated during the first release run of the film (early 1980s), this old Bollywood poster was designed and printed for publicity of the film but never ended up being used. This vintage Bollywood poster for sale was originally designed in hand painted oil on canvas format by one of the finest Bollywood poster painters of his time, V.G. Parchure of Pamart studio fame. His printed signature in the name of his art studio appears on the bottom right hand corner of this vintage Bollywood poster. True to master Bollywood poster painter V.G. Parchure’s trademark style, this old Bollywood poster features stunning hand painted imagery. A large hand painted side profile of Manoj Kumar is seen prominently on the poster. A sailing ship appears alongside. Smaller hand painted portraits of Dilip Kumar and Shatrughan Sinha are seen on the top. Smaller photographic stills appear at the bottom of this vintage Bollywood poster for sale. 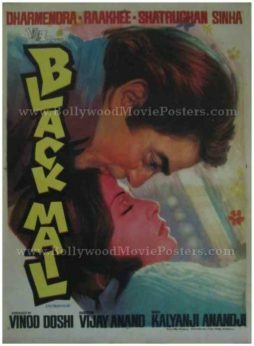 Vintage Hindi film poster of the old Bollywood movie, Black Mail (1973) for sale. This is an actual surviving original first release poster of the 1973 Bollywood thriller that starred Dharmendra and Raakhee in lead roles. Printed and circulated somewhere in the early 1970s during the original first release run of the film, this vintage Hindi movie poster was designed and printed for publicity of the film but never ended up being used. This vintage Indian film poster was originally designed in hand painted oil on canvas format by Bollywood’s greatest movie poster artist, Diwakar Karkare. His printed signature is seen on the bottom right hand corner of this vintage Hindi film poster. Typical of Bollywood poster painter Diwakar’s brilliant art style, this vintage Indian film poster features stunning artwork. Lead couple Dharmendra and Raakhee are seen in a brilliant hand painted rendition. Actress Raakhee’s portrait appears in a shade of pink, signifying passion and romance in this vintage Bollywood poster. 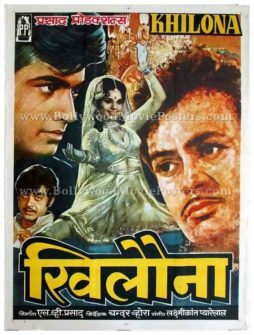 The typography appears vertically arranged in bright yellow, giving this vintage Hindi film poster a stunning appearance. Hand drawn old Bollywood poster of the hit Hindi film, Gambler (1971) for sale. This is an actual surviving vintage Bollywood poster of the 1971 film that featured the evergreen superstar of Indian cinema, Dev Anand in the lead role. Printed and circulated a few years after the first release of the film (somewhere in the late 1970s), this movie poster was printed for publicity of the film but never ended up being used. This poster was originally designed on a hand painted canvas by a small time art studio in Delhi, giving it a quirky appearance. 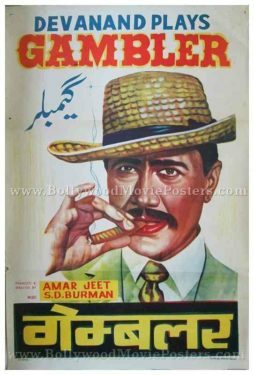 In this vintage movie poster, the Bollywood poster artist depicts Dev Anand in a large solo portrait wearing a hat and smoking a cigar. 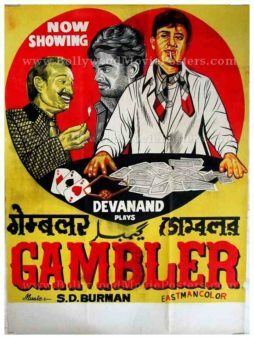 Gambler is a 1971 hit Hindi film starring Dev Anand, Shatrughan Sinha and Jeevan. Dev Anand is considered one of the greatest actors in Indian cinema, with a career spanning over 65 years during which he appeared in over 100 films as lead actor. The film is fondly remembered for its music by ace music composer SD Burman. In particular, the track “Chudi Nahi Yeh Mera Dil Hai” sung by Kishore Kumar continues to be played till today. 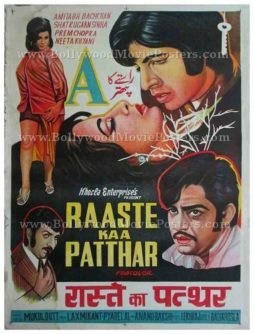 Old hand painted Bollywood movie poster of the Hindi film, Raaste Kaa Patthar (1972) for sale. This is an actual surviving old Bollywood poster of the 1972 Hindi film that starred the biggest superstar of Indian cinema, Amitabh Bachchan in the lead role. Printed and circulated a few years after the first release run of the film (1970s), this vintage Bollywood movie poster was designed and printed for publicity of the film but never ended up being used. This poster was originally designed in hand painted oil on canvas format by a small time poster design studio, giving it a very quirky appearance. The letter A appears prominently on the poster, signifying the Adult rating under which the film was released in theaters. Superstar Amitabh Bachchan is seen in a romantic pose on the top. Quirky hand painted portraits of Shatrughan Sinha and Prem Chopra are seen at the bottom. A single room key is seen dangling on the top right hand corner of the poster, giving a subtle hint into the plot of the film. Vintage hand painted Bollywood movie poster of the Hindi film Ramkali (1985) for sale. This is an actual surviving hand painted Bollywood poster of the classic bandit movie Ramkali that featured the dream girl of Indian cinema, Hema Malini in a bandit avatar. Printed and circulated during the original first release of the film (mid 1980s), this hand painted Bollywood movie poster was originally designed for publicity of the film but never ended up being used. This Bollywood poster was originally designed on a hand painted canvas by Rangshala art studio and bears a printed signature of the same on the bottom left corner. This vintage Bollywood poster features superbly hand painted portraits of Hema Malini in two strikingly different avatars – one as a bandit on the top and the other as a dancer at the bottom. A fabulous hand painted portrait of Shatrughan Sinha is also seen on the top. Ramkali is a bandit film released in 1985 featuring Hema Malini, Shatrughan Sinha, Nirupa Roy, Ranjeet, Kader Khan and Suresh Oberoi. 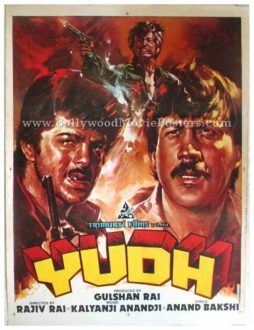 Old hand painted Bollywood poster of the Hindi action drama, Yudh (1985) for sale. This is an actual surviving old Bollywood poster of the 1985 film directed by Rajiv Rai starring Anil Kapoor (of Slumdog Millionaire fame) and Jackie Shroff in lead roles. This beautiful hand painted Bollywood poster has been designed by the greatest calendar artist in India, JP Singhal and bears his printed signature in the name of his studio “Singhals” on the bottom right hand corner, making this poster highly collectible! Printed and circulated a few years after the first release of the film (Late 1980s), this old hand painted Bollywood movie poster was originally designed for publicity of the film but never ended up being used. This beautiful hand drawn Bollywood movie poster features tell tale signs of calendar artist JP Singhal’s superb brush strokes. 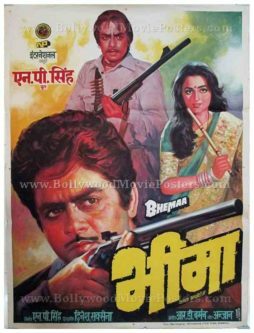 A brilliantly painted large close up of Anil Kapoor smoking a cigarette and holding a gun is seen on the left of the poster. Another highly realistic hand painted portrait of Jackie Shroff is seen with broad visible brush strokes on the right. A smaller hand painted portrait of villain Danny Denzongpa holding a pistol is seen on the top. The three independent portraits display a fantastic sense of synergy and merge flawlessly. Yudh is a 1985 Indian Bollywood action thriller produced by Gulshan Rai and directed by his debutante son Rajiv Rai. The film had an impressive star cast including Jackie Shroff, Anil Kapoor (in a dual role), Tina Munim, Pran, Danny Denzongpa, Nutan, Shatrughan Sinha and Hema Malini. 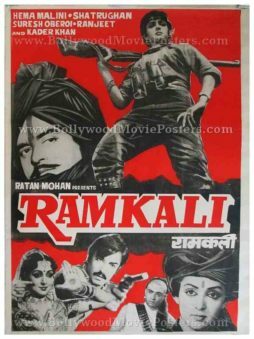 Old vintage black and white Hindi movie poster of the Bollywood film Ramkali (1985) for sale. 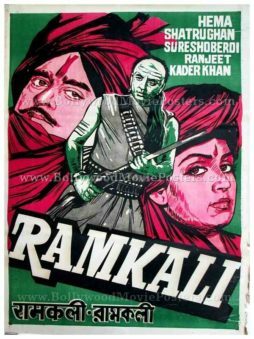 This is an actual surviving vintage poster of the classic Bollywood movie Ramkali that featured the dream girl of Indian cinema, Hema Malini in a bandit avatar. Printed and circulated a few years after the release of the film (late 1980s), this classic black and white Hindi movie poster was originally designed for publicity of the film but never ended up being used. This poster was originally designed by cutting out still black and white photos and pasting them on a board. The background and text are hand painted, making this poster an interesting mix of two different design techniques. Ramkali is a bandit film released in 1985 featuring Hema Malini, Shatrughan Sinha, Nirupa Roy, Ranjeet, Kader Khan and Suresh Oberoi. This photographic old black and white Indian cinema poster features the bandit couple, Shatrughan Sinha and Hema Malini prominently on the top, while villain Ranjeet and other supporting characters are seen in smaller sized still photos at the bottom. 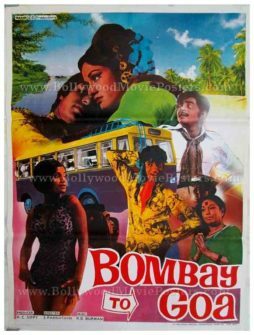 Old hand painted vintage Bollywood movie poster of the memorable Hindi film, Bombay to Goa (1972) for sale. This is an actual surviving vintage Bollywood poster of the 1972 comedy film that featured the biggest superstar of Indian cinema, Amitabh Bachchan in the lead role. Amitabh Bachchan had appeared in a few Bollywood films prior to Bombay to Goa, but this was his first role as “hero.” His earlier films such as Saat Hindustani (1969), Parwana (1971) and Anand (1971) saw him cast as a supporting actor. 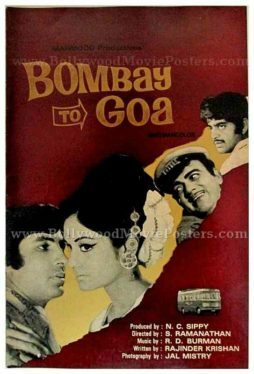 It was after the success of Bombay to Goa that Amitabh's prowess as lead actor was established, winning him lead roles in subsequent blockbusters such as Zanjeer(1973). Printed and circulated a few years after the release of the film (mid 1970s), this vintage hand painted Bollywood poster was originally designed for publicity of the film but never ended up being used. This old Amitabh movie poster was originally designed in hand painted format (oil on canvas) by a leading Bollywood movie poster design studio, further increasing its collectible quotient! 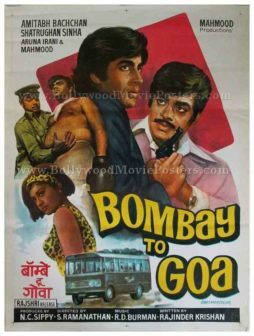 In the poster, Amitabh Bachchan is seen in a young hand painted avatar with Shatrughan Sinha on the top. One of the greatest comedians of Bollywood, Mehmood appears alongside in a much smaller hand painted figure wearing boxing gloves. Actress Aruna Irani is seen in a beautiful young avatar on the bottom of this old Amitabh movie poster. The typography used in this poster is entirely in English, except for a translated title in Devanagri Hindi at the bottom. The bus painted at the bottom is indicative of the journey that the plot of this Bollywood comedy revolves around. Beautiful hand painted vintage Bollywood movie poster of the hit Hindi film Khilona (1970) for sale. This is an actual surviving publicity poster of the 1970 hit Hindi film, which featured Sanjeev Kumar, Mumtaz, Shatrughan Sinha & Jeetendra. Khilona received several award nominations and bagged a couple of awards, including the best movie of the year, making this old Bollywood movie poster highly collectible! Printed and circulated a few years after the release of the film (somewhere in the late 1970s), this artistic hand painted Bollywood poster was originally designed for publicity of the film but never ended up being used. This poster was originally designed on a hand drawn canvas by a leading Bollywood movie poster art studio, making it very collectable. The poster features a beautiful cut out still photograph of actress Mumtaz in the center, flanked by large over-painted faces of actors Jeetendra and Sanjeev Kumar. 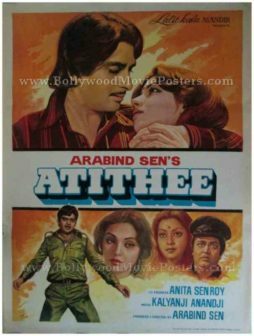 A still photograph of Shatrughan Sinha is seen pasted on the lower left of this vintage Bollywood movie poster. Khilona (Toy) is a 1970 Bollywood film starring Sanjeev Kumar and Mumtaz in lead roles. The film was declared a hit at the box office and received several award nominations, eventually bagging the best movie award for the year it was released in. 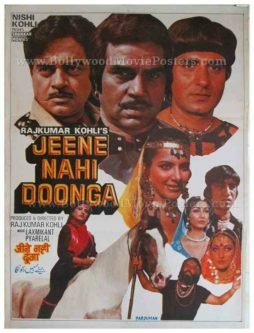 Beautiful collage styled old Bollywood movie poster of the Hindi film Jeene Nahi Doonga (1984) for sale. This is an actual surviving vintage movie poster of the 1984 old Hindi film that starred Dharmendra, Anita Raj and Shatrughan Sinha in lead roles. Printed during the first release of the film (somewhere in the mid 1980s), this Bollywood collage styled poster was originally designed for publicity of the film but never ended up being used. In this old Bollywood poster, the artist has created an interesting collage of still photos of the respective stars from the film. Jeene Nahi Doonga (Won’t let you live) is a 1984 Bollywood film starring Dharmendra, Anita Raj and Shatrughan Sinha in lead roles. 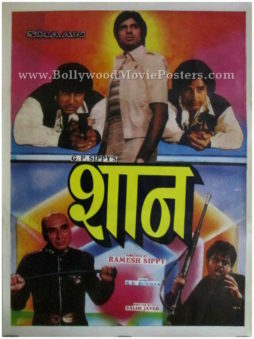 Large hand painted Bollywood movie poster of the hit Hindi film Shaan (1980) for sale. This is an actual surviving original two sheet Bollywood poster of the 1980 classic Hindi film which featured the greatest superstar of Indian cinema, Amitabh Bachchan in the lead role. This vintage two sheet poster measures a stunning 60″x40″ inches in size when its two individual sheets are joined or pasted together. The poster comprises two separate single sheets, each measuring 40″x30″ inches. Printed and circulated several years after the first release of the film (somewhere in the late 1980s), this old Hindi film two sheet poster was designed for publicity of the film but never ended up being used. This large Bollywood poster was originally designed on a hand drawn canvas by a small time art studio in Kolkata, further increasing its collectible as well as quirk quotient. 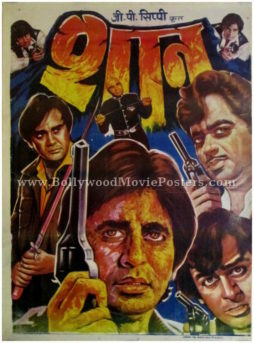 In this old hand painted Bollywood movie poster, a large hand painted portrait of superstar Amitabh Bachchan holding a gun is seen on the center, with supporting actors Shashi Kapoor and Shatrughan Sinha on his either side. A quirky hand drawn mugshot of Sunil Dutt appears on the bottom left of the poster. Bollywood’s infamous villain, Kulbhushan Kharbanda who played the memorable character of Shakaal in the film, is seen in a quirky hand painted avatar on the bottom right of the poster. This quirky hand drawn old Hindi film poster is set against a black background with hand painted flames appearing at the back. The title of the film appears in both English as well as Devanagari Hindi. 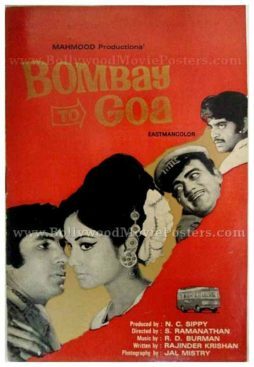 Old Bollywood pressbook of the memorable Hindi film Bombay to Goa (1972) for sale. This is an actual surviving pressbook of the 1972 film that featured the biggest superstar of Indian cinema, Amitabh Bachchan. Printed and circulated during the first release of the film, this old Bollywood pressbook was originally designed for publicity of the film but never ended up being used. Bombay to Goa (1972) was the first Hindi film which starred Amitabh Bachchan in a lead role, making this old press booklet highly collectible! Vintage Bollywood press books are sometimes also referred to as song booklets, story booklets or synopsis booklets. They contain the lyrics of songs from the film in Hindi as well as in Urdu, and were designed to give theater audiences the chance to sing along while watching their favorite songs on screen. Old Hindi film synopsis booklets provide a further additional step of information – summarizing the plot of the movie as well as the star cast. Old Hindi film press books, such as the one featured here for sale, make great small wall hangings when framed and displayed on a wall, as they feature interesting artwork of the film on the cover. This old Hindi film press booklet is maroon in color and features black and white still photos of key characters from the film, namely superstar Amitabh Bachchan, Mehmood, Shatrughan Sinha & Aruna Irani. This old Hindi film press booklet is orange in color and features black and white still photos of key characters from the film, namely superstar Amitabh Bachchan, Mehmood, Shatrughan Sinha & Aruna Irani. Hand drawn old Hindi film poster of the hit Bollywood movie Gambler (1971) for sale. This is an actual surviving vintage poster of the 1971 film that featured the evergreen superstar of Indian cinema, Dev Anand in the lead role. Printed and circulated a few years after the first release of the film (somewhere in the 1970s), this movie poster was printed for publicity of the film but never ended up being used. This poster was originally designed on a hand painted canvas by a small time art studio in Kolkata, making it highly collectible. For the sake of convenience, this single sheet poster was printed in two parts – each part measuring half sheet in size (30″x20″ inches). When these two half sheets are combined and pasted together, they form a complete 40″x30″ inches single sheet poster as seen in the adjoining photograph. In the poster, the Bollywood poster artist depicts Dev Anand in a large solo portrait. Thumbs hooked in his pockets, Dev Anand is seen wearing a checkered shirt in the poster, with cards strewn around in the background. Typography used in this old Dev Anand film poster is in English with the title translated into Devanagari Hindi. This poster is in two parts – each part measuring half sheet in size (30″x20″ inches). When these two half sheets are combined and pasted together, they form a complete 40″x30″ inches single sheet poster as seen in the adjoining photograph. The poster is split neatly in the middle and joins seamlessly without any overlap. Hand drawn, quirky old vintage Bollywood movie poster of the hit Hindi film Gambler (1971) for sale. This poster was originally designed on a hand painted canvas by a small time art studio in Kolkata, making it highly collectible. In the poster, the Bollywood poster artist depicts Dev Anand wearing his trademark muffler around his neck and smoking a cigarette at a casino table. Two quirky hand drawn portraits of actors Shatrughan Sinha & Jeevan appear by his side. 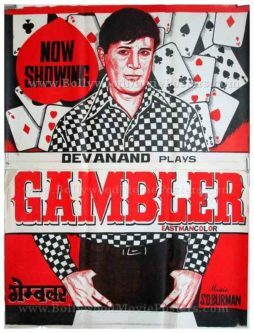 All three hand drawn portraits are encased within a red heart, whereas three aces are shown distinctly on the casino table to reflect the plot of the film in this old Dev Anand movie poster. Typography used in the poster is in English with the title translated into Devanagari Hindi, Urdu as well as Bengali. 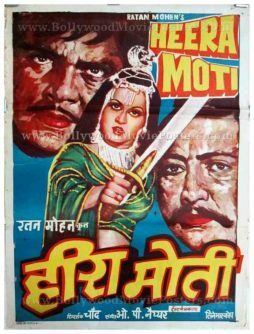 Quirky hand painted old Bollywood movie poster of the Hindi film Heera Moti (1979) for sale. This is an actual surviving poster of the 1979 film, which featured lead actress Reena Roy in a Charlie’s Angels like avatar. Printed and circulated after the release of the film, this quirky hand drawn old Bollywood movie poster was originally designed for publicity of the film but never ended up being used. This poster was originally designed on a hand drawn canvas by a small time poster art studio in Delhi, making it very collectable. A large hand painted portrait of the lead actress Reena Roy is seen at the center of the poster wielding a sword. Hand drawn faces of the other two key characters of the film, Shatrughan Sinha & Danny Denzongpa appear on either side of her. Very few hand drawn, old Indian cinema movie posters feature women as action figures. Heera Moti is one of the rare few, making it very collectable! Typography in the poster is seen both in English on the top, as well as Devanagari Hindi at the bottom. Heera Moti (Diamonds & Pearls) is a 1979 Hindi action film starring Shatrughan Sinha and Reena Roy in lead roles. The plot of the film revolves around a race to steal precious temple jewels. Two people, Heera & Moti, played by Shatrughan Sinha & Danny Denzongpa respectively, attempt the burglary. The temple is guarded by a woman skilled in the art of self defense, Reena Roy, who confronts them. Old hand painted Bollywood poster of the Hindi film, Kaala Patthar (1979) for sale. This is an actual surviving vintage poster of the 1979 film that featured the greatest superstar of Indian cinema, Amitabh Bachchan in the lead role. Printed and circulated several years after the first release of the film, this movie poster was originally designed for publicity of the film but never ended up being used. The original design of this poster was made on a hand painted canvas by the greatest and highest paid Bollywood movie poster artist of all time, Diwakar Karkare. In the poster, Diwakar captures the original angry young man of Bollywood, Amitabh Bachchan, in a black tone to highlight his character as a toiling coal miner. The other supporting actors Sharughan Sinha and Shashi Kapoor are depicted in superbly accurate portraits on the top, wearing mining helmets. The climax scene of the film, where workers are trying to find a way out from the caved-in mine, is depicted as a suggestion on the top of the poster. The typography used in this old Amitabh movie poster is entirely in English. Since this poster was printed several years after the first release of the film, the typography as well as the overall quality of the print appear blurry. Old hand painted Bollywood movie poster of the Hindi film Bheema (1984) for sale. This is an actual surviving poster of the 1984 film that featured Shatrughan Sinha, Ranjeet and Jaya Prada. Printed and circulated somewhere during the first release of the film, this old Bollywood poster was originally designed for publicity of the film but never ended up being used. The poster was originally designed on a hand painted canvas, making it very collectable. The artist has chosen a very simplistic approach in hand painting this poster, as seen by the large and highly realistic portraits of the lead actors. 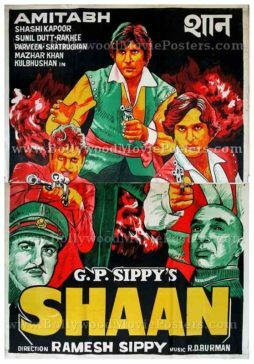 The villain, Ranjeet on the top as well as the hero of the film, Shatrughan Sinha are seen holding guns, giving the poster an action oriented look. The typography used in this poster is entirely in Devanagari Hindi except for a translation of the title in English on the bottom right. 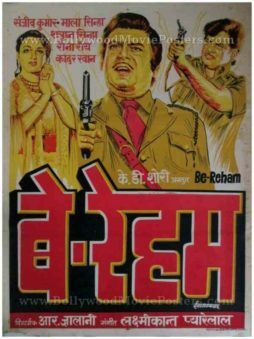 Bheema is a 1984 action film starring Shatrughan Sinha, Ranjeet and actress Jaya Prada. The film is known for its music, composed by one of the greatest music directors in Bollywood, RD Burman. In the film, Shatrughan Sinha plays a police officer who is frustrated with the legal system where criminals often go free. In retaliation, he turns vigilante hunting down bandits earning him enemies on both sides of the law. Hand painted vintage Bollywood movie poster of the hit Hindi horror film Jaani Dushman (1979) for sale. This is an actual surviving poster of the 1979 Bollywood horror film that featured the largest multi-starrer cast for any horror movie ever made in Bollywood. Printed and circulated several years after the first release of the film (somewhere in the late 1980s), this movie poster was printed for publicity of the re-release of the film in the 1980s but never ended up being used. This Bollywood horror movie poster was originally designed on a hand painted canvas giving it a very quirky, vintage appearance. In the poster, a large hand painted figure of the monster with blood dripping from its teeth is depicted on the left. Key protagonists from the film’s multi-starrer cast are painted alongside on the right. Typography used in the poster is primarily in English with the title translated in Devanagari Hindi as well. 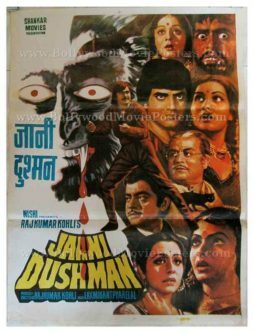 Jaani Dushman (Enemy of Life) is a 1979 Bollywood popular horror film with a huge starcast that comprised some of the biggest stars in Bollywood at the time. The film was initially banned by censors but later released with an A-certificate. This is a landmark film in that it comprises the largest ever multi-starrer cast used in a Hindi horror movie – the only example of its kind ever made in Indian cinema. Beautiful hand painted old Bollywood movie poster of the Hindi film Ramkali (1985) for sale. 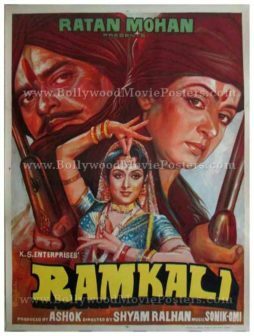 This is an actual surviving poster of the classic bandit movie Ramkali that featured the dream girl of Indian cinema, Hema Malini in a bandit avatar. Printed and circulated somewhere during the release of the film, this quirky, hand drawn old Bollywood movie poster was originally designed for publicity of the film but never ended up being used. This poster was originally designed on a hand painted canvas by a small time art studio in Kolkata, giving it a very quirky hand drawn appearance. The poster features the film’s title in three different languages at the bottom, including two regional – Hindi & Bengali. Ramkali is a bandit film released in 1985 featuring Hema Malini, Shatrughan Sinha, Nirupa Roy, Ranjeet, Kader Khan and Suresh Oberoi. This quirky, hand drawn old Indian cinema poster features the bandit couple, Shatrughan Sinha and Hema Malini prominently side by side, with the villain Ranjeet holding a rifle in the center. The two color tone used in the printing of this hand drawn movie poster adds to its quirk quotient.